I came to this set, and to the music of Sir Malcolm Arnold more generally, as a total novice, knowing him only by reputation. How glad I am that I took the plunge and explored him. I know little of his world beyond the symphonies, and to those I am pretty fresh but I am happy to report that it is a world worth exploring. 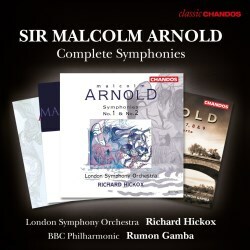 Arnold is of the generation of composers that matured after the Second World War; it was in 1948 that he gave up his post as principal trumpet of the London Philharmonic to become a full-time composer. Inevitably, you can hear much of the influence of those who came before him, notably Vaughan Williams. Unlike some, however, Arnold was a firmly tonal composer who embraced melody and used it unashamedly. The booklet notes, which are up to Chandos’ usual high standard, include a quotation from Donald Mitchell where he says that Arnold “pours out tunes as if he were unaware that much music in our century has had to get along without them.” These are symphonies from the second half of the twentieth century which are, nonetheless, tonal, melodic and often very lyrical, and that alone is something worth remarking on. Key to Arnold’s style is an almost Mahlerian love of contrast. I draw attention to this in writing about the individual symphonies below, but repeatedly the music will seemingly be plunged into a particular mood or atmosphere and then, out of nowhere, will change utterly, sometimes for only a few bars, sometimes for a much longer period. It’s remarkable and, more often than not, extremely effective, not least because it tends to be so surprising. I suspect that most readers who are considering this set will be more interested in the music than in the comparative performances. After all, there is very little competition on the market, though a notable exception is another complete set on Naxos (review review review) with the National Symphony Orchestra of Ireland — which I haven’t heard — so if you’re thinking about whether you should shell out and buy the complete set then I urge you to do it. The Decca Universal/Handley boxed set seems to be no longer available (review). Symphony No. 1 dates from the time after Arnold became a full-time composer — it was completed in 1949 — and it features a combination of rich, Romantic strings, a little in the manner of Vaughan Williams, with a more driven ostinato that sounds almost mechanical in places. Then there are hints of Mahler in the section of the first movement where the lonely flute sings out against its background of sadness. There is rumbling uncertainty as themes appear and disappear in a kind of musical fog, while in the final strait the strings try to assert their lyrical content theme over the ostinato attack of the trumpets beneath. The central Andantino begins much more lyrically and simply with violins and flute, but I loved the way Hickox, who is clearly entirely convinced by this music, injects an element of the dangerous and sinister into the funeral march-like section that follows. Throbbing low brass makes an ominous undercurrent for the lighter motivic sections that follow but it comes to a surprisingly restful conclusion. The dashing contrapuntal finale is a kind of fugue-meets-Rondo-meets-perpetuum-mobile. I loved the slightly subversive march theme that interrupts the music before giving way to what is tantamount to a repeated brass chorale. In the First Symphony I noticed something that I was to notice again and again, notably the gleeful, almost brash technicolour of Arnold’s orchestration. It’s colourful but, at this stage of his career, perhaps not particularly refined, as the orchestral colour has a tendency to lurch in this symphony. Maybe, however, that's key to his attraction: genial, attractive, approachable, unwilling to obfuscate, appealing in what is often the music’s simplicity. No. 2 opens with a remarkably genial first subject, sounding bright as a button played by the LSO, followed by a folksy, attractive second theme. Arnold casts it in sonata form, and it made me strangely amused to think that that still existed in 20th century music. The Scherzo that follows treads the line between zany and threatening, and the third movement removes all doubt in being a heartfelt elegy, full of poignancy and deep feeling — beautiful but also rather eerie in places, carrying serious weight. The finale then explodes onto the scene, light-hearted and full of joy, leading to a joyously upbeat conclusion. There is a sultry allure to the string theme that opens No. 3, and it reminded me of much of John Barry's film music. There is an element of drama and argument to it, nevertheless, and by the time of this symphony (1957) he seemed to have tamed some of his orchestration skills while retaining lots of colour. The notes describe this as a tragic work, but I’m not so sure, at least in the first movement. It’s serious, though. At times the argument even feels a little like a baroque Passacaglia in the way it seems to spiral around a particular idea. A long-breathed string theme launches the slow movement. This is much closer to what you might call tragic. There's something bleak about this music, as if it's on a quest for something it never finds. It reminded me a little of Shostakovich, in fact, such as the searching quality to the slow movement of the Leningrad Symphony, or even the first movement of the tenth. It’s lonely music that contains outbursts of passion in an overall darkness of mood. There are more hints of Shostakovich in the rather unconvincing manic smile that characterises most of the busy finale, with gurgling winds and busy strings that seem to be propelling everything forward. This movement is also more prone to using contrasting blocks of sound, and the ending features a really rather alarming rhythmic ostinato that suggests something very dark on the horizon, or perhaps it’s closer to home than you might wish. It was this symphony that first made me realise how I love the way Arnold writes for strings. They often give their theme in unison, and Arnold makes them sound richly Romantic and full of ardour, but never over-the-top: instead they have that native English restraint that is totally characteristic, and which reminds me, at times, of the Vaughan Williams of the Fifth Symphony. No. 4 is more mysterious. The opening has lots of gamelan-style colour, with a sweeping string theme and then more delicate figurations. There is an element of menace from some percussion, though, and the rumbling ostinato on the marimba accompanies more violent outbursts. This is one of those characteristic contrasts of mood that is almost schizophrenic: very contrasting elements sit right alongside one another in a way that can be rather perturbing. It moves from that into a disarming, charming two-step style tune — inspired by a Jamaican steel band, the notes tell me. That violence becomes all the more perturbing as the movement continues but that quirky steel band theme remains stubbornly resistant to change. There is a quirky, almost fractious air to the Scherzo, with lots of chromatic darting and questing for a firm base, reminding me of some of Mahler's darker scherzos. It even ends with a thud that reminded me of the tenth symphony. The slow movement has much more of a romantic sweep to it, both in terms of its themes and it orchestration; all surging strings and exotic percussion, full of suggestions of something exotic; that Jamaican feel again, perhaps? There's a slow-moving majesty to it, all the same, and that cinematic breadth to the string theme is very winning. There’s also a strong sense, particularly in the sultry trombone glissandi, of Arnold’s love of jazz, and this is only one of several areas of the symphony that sound jazz-inspired. The finale then features explosive, almost provocative counterpoint, with a fugal subject that seems to be spat out by each instrumental group, ending in a blazingly positive final chord. The Fifth Symphony is more serious, even abrasive at times, but still there is a delicate, magical feel to the orchestration of its second theme with its harp, celesta and glockenspiel. A violent brass-led interlude seems determined to bring the whole thing down, but that magical texture reasserts itself, the conflict generating a lot of development, but ending in an oddly subdued mood. The slow movement is one of Arnold's finest, though. A knockout string theme opens the music, with gently whispered violins over a texture of lower strings. Winds and timpani comment gently and the whole movement has an alluring lilt to its rhythm and a long, sensual line that is entirely winning. Arnold himself worried that it was clichéd and banal but I don't know what he was thinking – I loved it. The crazy-paving Scherzo that follows has a lolloping gait to it, almost like a cartoon character, and the schizophrenic element remains in the finale, balancing a quirky, marching band piccolo theme with some pretty intense, angry outbursts from the rest of the orchestra. It climaxes, very surprisingly, in a big restatement of that killer theme from the slow movement — which sounds fantastic as it is played here. Then, in an even bigger surprise, the orchestra simply dies away to ominously pealing bells. Marvellous. No. 6 feels much more intricately worked, more symphonically formed than many of the earlier symphonies. It's a product of his move to Cornwall, and in the first movement Arnold seems to make a lot more out of smaller motifs which he works through over and over again, producing something genuinely symphonic and motivically impressive. The mood is fairly dark and serious, but it gives way to another one of those magically still slow movements. This time the violins barely move while others picks out the chromatic, wandering main theme. It then turns into a ghostly funeral march (very Mahlerian) before (equally Mahlerian) an infectious rhythm out of nowhere strikes up the mood of a 1960s jazz bar. The funereal mood returns for the end of the movement, but is then dispelled by some rather anachronistically heroic brass that kick off the finale, a rondo whose main theme is characterised by boisterous brass, jangling percussion and confident strings. The internal episodes sound much more dark and spectral, however, as if searching for something more sinister. No. 7 begins with a very serious first movement but then – what do you know? - halfway through Arnold breaks into one of those jazzy episodes he is so good at and which by this time I had almost come to expect. It's very effective, but it is swiftly swept aside, however, and the crazy jangling of the opening returns. It is a stressful movement, containing lots of angst, and is almost war music by the time you get to the apocalyptic ending. The slow movement then begins with a long angular trombone solo that brings no comfort, and the mood only darkens went the strings enter, but there is a dark beauty to their playing which is very compelling. In the middle of the movement there is a repeated four-note rhythm that sounds like a strange, rather sinister knocking motion: it's quite creepy. Around the nine-minute mark there is a very sinister crescendo that culminates in something that feels like the music for a horror film. The finale begins with a surging string theme that also seems to threaten more violence and uncertainty but then, to my very great surprise, around the 4:30 mark Malcolm gives another interlude but this time it's Celtic sounding with what sounds like (but probably isn’t) a fife and a bodhrán. It's very surprising and rather jarring but, in its own way, very effective before the full orchestral chaos restarts. That knocking rhythm — this time with three notes — won't be silenced, however. For me this is Arnold’s darkest symphony, an exploration of very unsettling territory. The mood of unrest continues in No. 8 with a blustery, angry beginning which again, characteristically, is interrupted by a much more innocent sounding episode, almost like a child's nursery rhyme. That theme is later underpinned by an angry, rocking string theme, underlining the way Arnold often blurs the line between the light and the serious. The slow movement begins with a more pastoral air, but the trombones, when they enter, are more doleful, even threatening, and the violas seem to take things in a direction reminiscent in some ways of Vaughan Williams, the music still and almost peaceful, but always with a hint of danger. The finale, however, casts off all inhibitions, but again the relief is only temporary and there is a rather eerie passage with a pair of trumpets that suggests that all is not as well as you might initially think. The Ninth is in some ways his most economical symphony, but for me it is also his most disappointing, an unfortunate way to end the set. There are long passages for very sparse combinations of instruments (duetting flutes, for example, or oboes and violas), giving the whole thing a slightly strange air. It’s also rather repetitious, Arnold doing his work with rather limited musical material. The first movement culminates in a climax and crescendo that don't really go anywhere. The slow movement is much more successful, with a meandering wind theme on which the strings comment. It’s a beautiful set of contrasts but those spare textures recur again, and the effect is similar to what it was in the first movement. There are no such complaints with the quick-fire, zappily orchestrated scherzo, however, with its rapid dialogues and busy mood. In another sense, however, the symphony is not at all economical as its finale — at 24 minutes, the longest of all Arnold's symphonic movements — is a long, poured-out Adagio of almost Mahlerian breadth. To be fair to the BBCPO strings, they play it as if it was Mahler and they act as very convincing advocates. However, it is undeniably a very static piece, without really all that much going on. In fact, it's not until the six-minute mark that anything like a theme seems to emerge; before that it's mostly a repeated, lulling motion on the strings, which then makes its appearance again several times as the movement progresses. The ending is positive but, for me, unconvincingly so. I found this a disappointing way for Arnold to end his career as a symphonist. The orchestra that was due to give the piece its professional premiere pulled out before they did so, and I can kind of understand why. However, that shouldn’t put off anybody who wants to explore. Not many 20th century British composers wrote symphonies, and even fewer wrote a body like this — though some, notably Peter Maxwell Davies, wrote more. For that alone Arnold deserves recognition, and this is a fascinating body of work, full of contrasts, which will repay exploration. It's even better to explore this music in the company of such distinguished guides. The late, much lamented Richard Hickox was a champion of British music the like of which we have not seen, and he is a most convincing advocate for these symphonies. Rumon Gamba is every bit as distinguished, and both drive their performances through sheer commitment that carries their orchestras with them. There is very little to tell apart the sound-worlds of the two orchestras here, and both perform with commendable focus and commitment to the music, with the string sections sounding particularly good. Well done to Chandos, too, for recording it all. It’s testimony not just to their commitment to British music but, more generally, to their great artistic vision and their willingness to follow an idea, particularly when it is championed by such enthusiastic evangelists. The booklet notes, by the way, contain not just helpful comments on the music itself but also lots of contextual knowledge about the composer himself, and are a helpful guide to his musical world. Would I describe this music as great? I think I’ll have to live with it a little longer before I pronounce on that. It’s perhaps not as meaty or with as much going on as there is in, say, Britten or Vaughan Williams. There is often a feeling that Arnold is trying out ideas rather than having arrived at the completed version. However, that counts for little when the vast majority of what is on offer is so accessible and so undeniably appealing. Arnold’s love of melody alone means that he deserves to be better known, and those who turn to him for the first time are likely to find a sound-world that is open and welcoming to new explorers. When Webmaster and Site Founder sent me this set for review he included a note that said “There is a lifetime of fabulous listening in here.” He was right.